Thousands of votes were cast by ContractorUK readers and forum members during December 2015 and it is today that the results of the ContractorUK Readers’ Awards 2015, sponsored by Hiscox, are unveiled, with the likes of SJD Accountancy, Hays IT, HSBC and forum member ‘DodgyAgent’ winning awards. For the ninth year in a row, SJD Accountancy has won the Best Contractor Accountant (Large) Award, having retained the title ever since the very first ContractorUK Reader Awards. This year’s runner-up for best large contractor accountant is Nixon Williams, with PayStream coming in third place. PayStream has also been named the second best umbrella company of 2015, with Contractor Umbrella in third place, and Giant group winning the award. Giant group has regained the title after previously winning the award six times, their last of which was in 2013. “We are delighted to win the 2015 ContractorUK Best Umbrella Company Award.” Said Matthew Brown, Managing Director of Giant group. “We will continue to improve our services during 2016 and believe our new bespoke umbrella packages are perfect for the upcoming changes affecting the market”. Intouch Accounting was voted second best small/medium contractor accountant, with Genie Accountancy coming in third place. The hotly contested award for ‘Best Jobsite’ was this year won by Jobserve, with Technojobs hot on its heels retaining its title of runner-up for best jobsite for IT contractors. “Amongst such a broad range of competitors, Technojobs is very pleased to receive this acknowledgement from the contracting community.” said Anthony Sherick, Managing Director of Technojobs. The Best Training Provider of 2015 award goes to Capita, followed closely by The Learning People who have bagged runner-up in this category. Meanwhile Hays IT has received the most votes in the recruitment agency category, making it the best recruitment firm for IT contractors for the third year in a row. “To receive the award for Best Recruitment Agency by Contractor UK readers for a third consecutive year is tremendous,” said Managing Director of Hays IT, James Milligan. Aston Carter has also kept its runner-up award, and the third most votes this year went to Computer Futures, owned by the renowned SThree group. Whilst HSBC won the best client award once again, a new contender, Jaguar Land Rover, who announced at the beginning of 2015 that they were to create up to 1,300 new jobs, have scooped runner-up. Not only did Contractor Umbrella receive third place in the umbrella company category this year, but their MD, Lisa Keeble, or as she is known on the forum ‘LisaContractorUmbrella’, has won Best Forum Adviser of 2015. “This industry has gone through a lot of challenging times over the last few years and yet the camaraderie and banter on CUK remains,” said Lisa, who was “genuinely thrilled” to win the award. And after winning the award for six consecutive years between 2006 and 2011; test please delete has made a comeback, winning the 2015 Most Entertaining Forum Thread award. Fitting this year that the infamous ‘TPD’ thread has regained the crown, as in November it celebrated its ten year anniversary of creation. Older than the TPD thread, DodgyAgent, or DA as he is known along with countless others, not always friendly names, has won the Forum Personality of the Year for 2015. DA has hung around the forum since July 2005, always hopeful that he will be able to pick up a commission or find a benched contractor a seat. Never for love though, always looking for the hard cash in any situation. Don’t take the Arthur Daley avatar at face value though as DodgyAgent has been a valued contributor to the forum for over 10 years now, clocking up an astounding 15,000 posts along the way, and his advice has helped many contractors over the years. 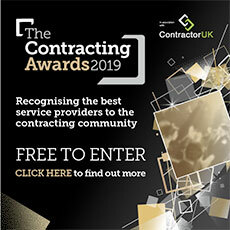 In an ever evolving industry, ContractorUK would like to thank all the contractors and companies that have come together to provide advice, support and content through this website and popular forum. And likewise thank you to all the winners mentioned above and those who have not been mentioned that have supplied high quality support to the contracting industry over the past year.